The housing boom--and crash--has many victims scattered among the neighborhoods in Chicago. Empty homes, unfinished condos, and boarded-up windows are all too common; currently the city has around 20,000 vacant homes and over 50,000 vacant lots. What follows when neighborhoods are affected by problems like these is increased crime, litter, and stress on the community due to the shared responsibilities of keeping the area clean and orderly. While Mayor Emanuel's city council is making headway in requiring maintenance in bank-owned properties, the city still has a lot of forgotten lots that become part of the scenery. For many residents, letting vacant land in their neighborhood sit idle is no longer acceptable. 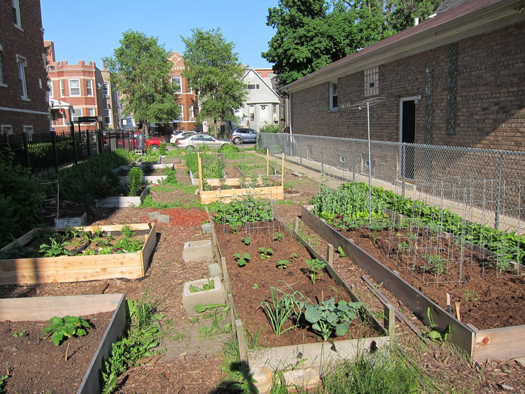 Trisha, who lives in the western side of Logan Square, participates in a community garden space with several of her neighbors. On a residential street among two-flats and single family homes sits a group of above-ground grow boxes. A former resident hatched the idea nearly 10 years ago of creating a community garden in the long-vacant space, and located the owner through city records to get his consent to use the land. Nowadays, the garden space has become the responsibility of the residents, and it's clear that they take the work seriously: they clean up trash that drifts into the garden space and shovel the sidewalk in the wintertime. They hung a friendly, colorful sign. The downside? They could be kicked out at any time. The space has switched owners several times since the garden's inception, most recently being sold earlier this year for $23,000, a paltry sum that residents would have likely pooled from their own pockets to buy had they known the lot was for sale. Trisha and her fellow gardeners are nervous that the new owner could have bigger plans for the lot, but they'll continue to tend to their vegetables and hope the growing season ends with the garden intact. Ben Helphand, the Executive Director of NeighborSpace, an organization that works with communities to establish and secure gardening space, knows the pitfalls of guerrilla gardening all too well. "Guerilla gardening is good when there are no other options, but ff there's ways to do things on the up and up, you should go through the front door," he said. His organization oversees 76 garden spaces in neighborhoods all over the city on land that was once abandoned or for sale for the purpose of expanding green, open space in the city. If you are part of a group of interested gardeners who want your own space for working your craft, you can apply for funds from NeighborSpace. 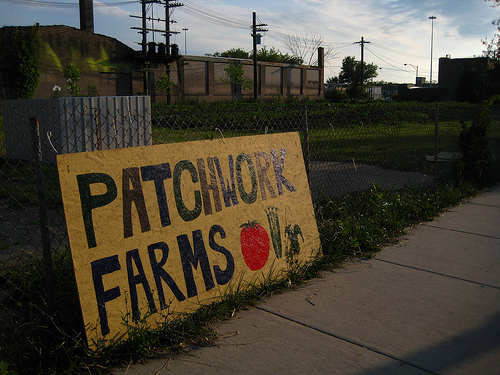 Patchwork Farms started earlier this year on a large plot of overgrown land on the West Side, near Chicago and California. Katie Williams, a longtime gardener who honed her skills at the Prairie Crossing Farm in Grayslake, partnered with her friend Molly Medhurst (and a large group of friends who volunteered their time) to develop the land into a U-Pick, CSA, and produce sales enterprise. The garden, which is marked with a colorful handmade sign and protected by makeshift fencing, has made a lot of progress in its short lifetime. Williams, who lives nearby, explained that she "wanted to grow food in the place we lived for the people living there." The farm sells produce onsite through their "veggie bike," which is equipped with a wooden cart that also transports Patchwork's wares to several other farmers markets and retail stores around the city. Williams and Medhurst are also helping run several nearby community gardens once maintained by the now-defunct Cob Connection. While the garden sits on a rather desolate stretch of Chicago Avenue that is littered with tattered industrial buildings, unsold new construction condominiums and a Metra railyard, Patchwork's leased land has been eyed for a possible Wal-Mart development. Local alderman Roberto Maldonado (26th Ward) has encouraged the retailer to open a store in the area, which would undo a valuable resource to a neighborhood that has a small handful of options for groceries. Luckily, as of early June, Maldonado was telling constituents on his Facebook page that "the Mayor's office informed us that Walmart is not interested in locating a store in the 26th Ward. They are continuing to look for sites throughout the city." While the coast seems clear for Patchwork to continue working, there's no guarantee that another initiative to drum up business in the area won't come along down the line. A new ordinance was proposed several days ago that will help community gardeners work in larger spaces, develop aquaponics-centered technology, and allow gardens to sell their produce in more areas. Given Mayor Emanuel's interest in urban farming and increasing access to nutritious food in underserved areas of the city, the future looks bright for urban gardening and for those dedicated people who beautify their neighborhoods by growing something where previously, little was thriving. Chicago has the right idea! Kudos for using vacant land for community gardens. Helps having the Mayor interested in urban gardening! Keep up the good work! Chicago is leading the way and hopefully other cities and conurbations will follow their excellent example! This initiative wins on all levels; it bring communities together, provides quality organic fruit and vegetables to local people and may also fund other projects in the local vicinity. I hope other cities take note and allow their vacant land to be developed too.